How does a pigeon avoid being lunch for a peregrine falcon? He flies fast, he stays in a flock for protection, and he (quite literally!) keeps an eye out for danger. Pigeons have such a wide field of view that they can see danger coming from almost any direction. There’s only a narrow place in front of them where both eyes focus and a narrow blind spot in the back. Pigeons are not alone. Many prey species have a wide field of view. 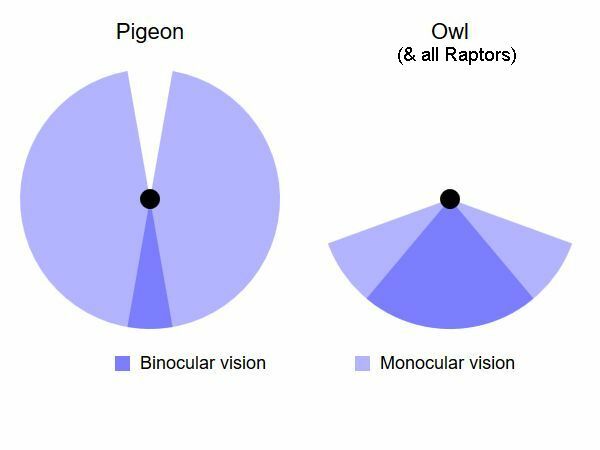 This is hard for us to imagine because our eyesight is like the raptor’s but raptors seem to know how it works. When a peregrine wants to sneak up on a pigeon he flies in the pigeon’s blind spot.